This is an amazing opportunity to own a one of a kind Estate on 6.78 +/- Acres. The main house boasts 6,000 sq ft +/- of living area. 4 bedroom, 3 1/2 bath, den/office, game room - bar/lounge with powder room. Plenty of room for you and your family to spread out in comfort with three separate zones of heating and cooling. A 4 car garage is attached and outside there~s plentiful space to relax and entertain in your very own Caribbean style outdoor enclosed kitchen, decks, outdoor shower, half bath and more - ready for your first party. Last, but certainly not least, is a 5,000 sf insulated Shop and Office with 3 roll up 10~ x 14~ doors. Centrally located between Berlin and Ocean Pines, just fifteen minutes from the Beach. Truly is a must see to fully appreciate. Call today to set up a private tour. Premier 262.62 Acre Tract made up of 5 contiguous parcels. 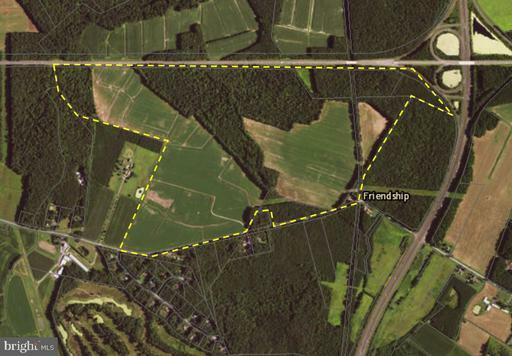 Total of 160 acres of prime tillable clear land and 102 Acres of mature Wooded Land. Located 7 miles from Ocean City and 2 miles from Berlin. Property has 5 confirmed perc sites with a potential for 12 total sites. Fantastic well managed quality hunting farm. Areas on property would be ideal for waterfowl impoundments and Ponds. 10,000+ feet of Road frontage combined along Rt 90 and Carey Rd. 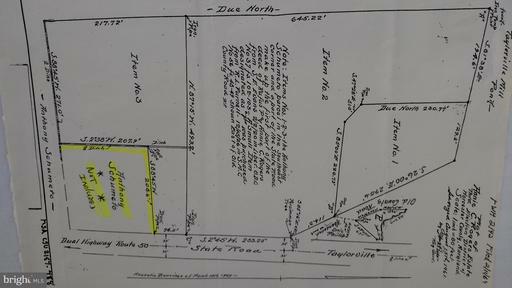 Owner will consider selling 112 acres that has 55 acres of tillable cleared land and 57 acres of wooded separately for $690k and the remaining 150 acre tract containing 105 acres of tillable clear land for $1.190mil. There are multiple opportunities for a property like this. Unparalleled excellence and luxury describe this waterfront modern masterpiece that merges inspiration and architecture. Custom built and designed by Poole Contracting just over a year ago, this estate with deeded boat slip is an entertainer~s dream home. Inside, with expansive, unobstructed water views, you will find a chef kitchen featuring a state of the art Cambria quartz waterfall island, double oven, Viking gas cooktop, U-line beverage fridges, custom cabinets with built-ins in the expansive walk-in pantry. The open-concept floor plan allows for easy flow for entertaining through the dining and great rooms. The dramatic, two-story great room features a floor to ceiling, gas fireplace with DuChateau Noir chevron wall. With the glass railing on the top deck and screen porch off the dining room, there truly is an unobstructed water view from every seat in the home. The owners suite features two custom walk-in closets, modern tiled shower with a separate soaking tub, dual sinks and heated tile floors. Enjoy coffee in bed as you watch the sunrise over the water. The private entryway leads you to the patio and pool with hot tub and lush tropical landscaping inviting the outside in. Take the elevator or grand staircase, with cable railing system, to the top floor where you will find three additional bedrooms. These spacious, light-filled bedrooms with en-suite bathrooms featuring heated floors, each have custom walk-in closets and serene views. On the ground floor, the entertaining abounds with a state-of-the-art theater and game room. The full bar/kitchen opens to the elevated back patio overlooking the water. Relax by the custom pool (with hot tub #2) as you watch the boats go by. As the sun goes down, the entertaining continues with the covered pool table and full outdoor bar/kitchen featuring a grill, crab pot burner, refrigerator, kegerator and much more. Catch a game on the TV while hanging in the hot tub or sipping a drink by the fire pit. 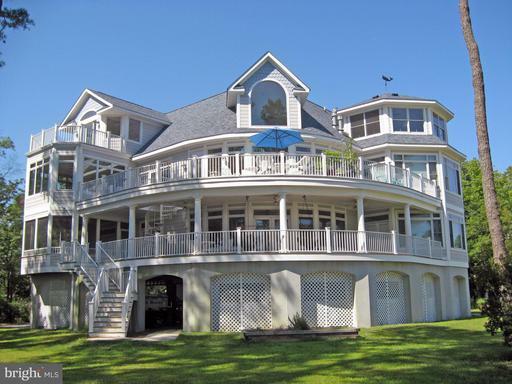 This incredible home comes with a deeded boat slip for the avid water adventurer. The community of Bay Point Plantation is surrounded by a 142 acre nature reserve with trails, marina, and a coveted, waterfront location. Berlin, named America~s Coolest Small Town, offers shopping, restaurants, horse-drawn carriage rides and fascinating history. Minutes to Assateague Island and Ocean City beaches, this prime location defines modern elegance at its finest! New Construction home by Custom Builder to begin early Fall, 2018 with premium upgrades, optional maid's quarters, 2 Master Suites with balconies off both as well as optional gas fireplaces, 5 bedrooms all have their own bathroom and walk in closets, 4 story elevator leading to a lovely observation deck with glass railings to capture the gorgeous sunset views of Gibbs Pond as well as a NE view of Ocean City golf course and club house. 1st Floor offers radiant heat flooring, wood burning fireplace in Great Room. Screened porch off kitchen, 2 laundry rooms, Nivian tank-less water heater, Heated In-ground pool with concrete decking to enjoy the lovely serene setting on .83 acres. Bulkhead with pier for boating convenience. Call now to have personal optional upgrades prior to construction. Spectacular sprawling estate complete with an oversize salt water pool on 7.77 magnificent acres in the exclusive neighborhood of Indian Creek. Immerse yourself in the ultimate ambiance and luxurious lifestyle this home offers. 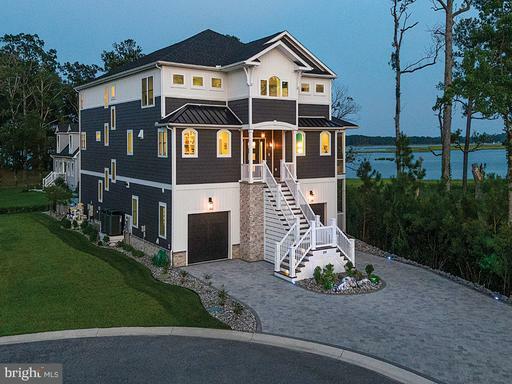 This sensational 6332 sq ft estate home is on almost 8 acres and is minutes from Assateague Island and Ocean City in one of the Eastern Shore's finest vacation destinations. The property features exceptional craftsmanship with astute attention to detail. This home is built for the sophisticated buyer looking for custom finishes inside and a private oasis outside. The home offers 5 bedrooms, 4 full baths and 2 half baths. Outside there is a huge in ground pool, beautifully landscaped custom paver patio, a gazebo, and a fully finished pool house with its own kitchenette, workout lounge, full bath, and large office or guest suite on the 2nd floor. The back yard is fully fenced and offers views of the pond. Inside the home you will find a fabulous gourmet kitchen with eat in dining area, a wet bar, wine cooler, a center island and Corian countertops, all of which will surely delight the chef in your family. Off the kitchen is a spacious great room with a wood burning fireplace for year round enjoyment and perfect for entertaining family and friends. Not to be missed is the three season sunroom with screened in porch off the kitchen which overlooks the pool and beautifully landscaped grounds. There is a formal living area and study with fireplace on the first floor as well. On the second level you will find the luxurious master suite complete with a sitting area and a master bath retreat. The additional bedrooms and bath are all large in size making this the perfect home for your family. Additional features in this estate home include: 3 car garage, hardwood floors, custom tile floors, crown moldings, tray ceilings, built ins, custom cabinetry, hardwood floors, custom window treatments and 4 zone high efficiency heat pump system. There is also custom lighting throughout the home, attic storage, and the list goes on and on. This estate home is approximately 1.5 miles from Ocean City Golf Course, 1.5 miles from the Public Boat Ramp, 2.4 miles from Rum Point Golf Course, 6 miles from Assateague Beach, 8.5 miles from Ocean City Airport, 9.4 miles from Sunset Marina and 10.5 miles from the Ocean City Boardwalk. Your family and friends are sure to make memories that last a lifetime here. Come see for yourself. Schedule your showing today and consider making this dream home yours!